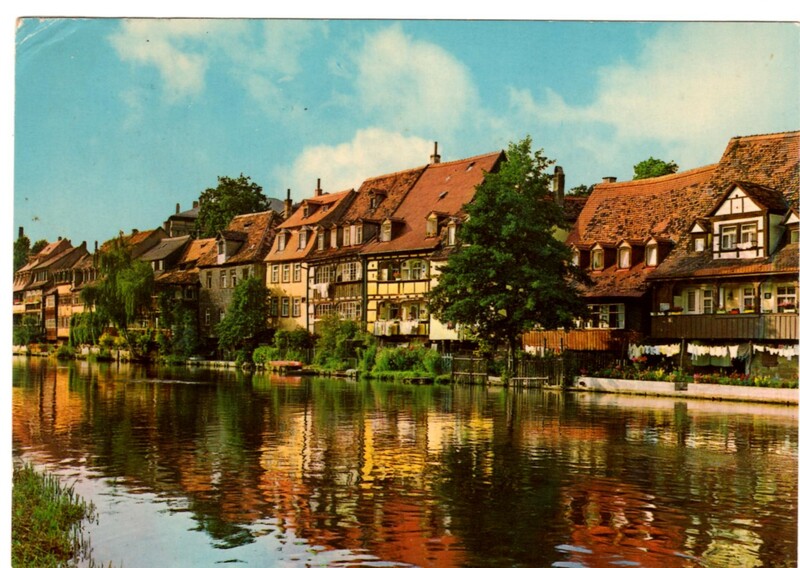 After one night in Nurnberg, I decided to reboard the train and move on to Bamberg. There were 6 Americans in my compartment, so we had fun chatting. One of the men was stationed here with the U.S. Army and was very informative. He stated that many of the German people hate the presence of the American military. He works long hours and there is constant pressure on his job. I really don’t have any peace from God about being a civilian nurse on the US Army base, but I want to pray more about it to make sure it is God closing the door and not me. I never had a response to my application in April. It only took one hour to come here on the train. I checked my bags in a locker and walked until I found the tourist office. The agent made me a reservation at a guest house for two nights for $10 each night. I asked the Lord for courage and took two city buses for 40 cents to the guest house on the outskirts of the city. It was beautiful with a farm and lake across the road and flower boxes everywhere! Now I will simply mention sights and sounds that have struck me as common to the German way of life. Schoolchildren with briefcases on their backs and clogs on their feet, children playing the fountain, beautiful babies in large carriages that are lifted on to the trains and streetcars, a young man kayaking, gorgeous rivers, flower boxes on every house, screenless windows that tip out, feather beds hanging out the windows to air, police cars that are green Volkswagen bugs, church steeples with bells every 15 minutes all through the night, dawn at 4 a.m., crepe paper toilet paper, 30 cents for public toilets with no soap or paper towels, no drinking fountains, city fruit stands, spectacular bakeries and meat shops! I enjoyed a lovely stroll around the pond this evening while praying and meditating. I smiled at a sweet 80 year old lady, and we struck up a conversation. I was able to give her a gospel tract which she gladly received. My German is slowly improving! I finally managed to catch a “Schnellzug” (fast train) to Passau and arrived in 3 hours. 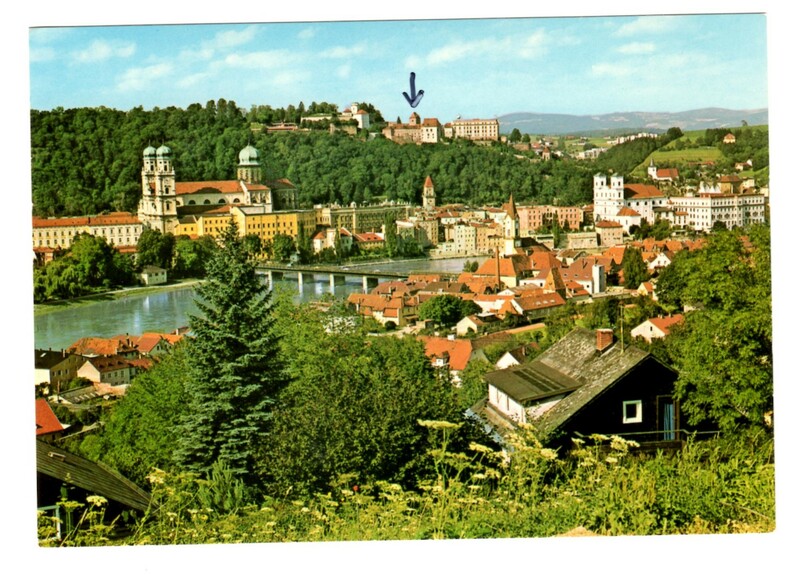 Passau is a beautiful city on the Austrian border where the Danube and Inn Rivers meet. I decided to try out a Youth Hostel for the next two nights which is located in a Castle! It sounds so romantic and gives me visions of knights in shining armor! “After lunch in a department store, I finally figured out which city bus to take which dropped me at the bottom of the mountain where the Castle was located. My feet were so tired from all the walking I had done already. I think I will wear out my new walking shoes on all these cobblestones and probably lose weight this trip! As I began trudging up the mountain, asking the Lord for strength to climb it with my two suitcases, an elderly man stopped his ancient rusty Ford Pinto and climbed out. He asked if I was going to the Hostel, and I replied, “Ja” (yes). He motioned for me to get in, and he put my bags in the back. My mother always told me not to hitchhike, but he looked very friendly ! My tired feet won out, so I climbed in and asked the Lord for safety. He drove me two kilometers up the mountain and dropped me off at the door of the Hostel. I gave him a hearty “Danke schon!” (thank you) and bid him goodby. The sign on the door stated the hostel opened at 5 p.m. Since it was only 2 p.m., I toured the fascinating Castle museum across the road. Then I settled down on a nice bench to read. At 5 p.m., they unlocked the doors and I paid my $1.75 for two nights. I walked into the women’s bunk room and put my sheet sack I brought with me on a lower bunk. There were no lockers for my bags, but I guess I didn’t have anything too valuable. I met a very pleasant German girl who actually spoke very good English! I have only encountered a few Germans who speak English. Dinner with the “group” was unreal in the communal dining room. Hostel Dinner ticket with the “Group” ! Several high school tour groups are here and act like typical teens – very loud and immature. I think this is my last time in a hostel. I would rather pay more for peace and privacy! Castles aren’t really romantic at all. So much for all the fairy tales I heard as a child. I feel so lonely tonight even with so many people around, and am feeling the language barrier acutely, but it is precious to hide under the wings of the Lord. I continued to pray about being a civilian nurse on the Army base, but God did not give me peace about going this direction. I never had any response to my application, so continued working at the hospital on the diabetes unit when I returned home. Since 1978, I have met many people here in the USA from other countries who struggle with communicating in English. Because of my experience with the isolation of being the foreigner in other countries I have visited, I can readily identify with them. I greatly appreciated the Germans who spoke clearly and slowly to help me understand them, and I try to remember to do the same when speaking with foreigners here. Smiles and pantomime still go far in breaking down language barriers!